This is the name of the business as it exists in 2018. The incumbent for many years was Paul Marius DESMURE, and when he died in 1983, two company employees bought the business from his estate and continued to operate. So the scope of this story is limited to the period 1932 to 1983, plus a few subsequent events – from the origins up until the day when Paul Desmure – born on 20/02/1921 at St. Just d’Avray – departed this world. The valley of the river Azergues runs through rolling rural countryside to the north-west of Lyon, between the river Saône and the hilltops of the Col des Echarmeaux. There are hilltop villages, and vines that produce Beaujolais wine. At the southern end of the valley there is quarried a yellow sandstone that gives the region its title of ‘Pays des Pierres Dorées’. There are lots of villages – Lamure-sur-Azergues, St. Nizier d’Azergues, Cublize, St. Just d’Avray, Chambost-Allières (where the depot is in 2018) - but we will concentrate on GRANDRIS, a village 55 kms north-west of Lyon and 35 kms west of Villefranche, and terminus of the Grandris to Lyon route which is at the centre of this story. The village had a population of 1,444 in 1931 which had fallen to 1,145 in 2015. Note that Grandris had competition from the smaller village of Lamure-sur-Azergues, 4 kms away, population 978 in 1931 and 1,048 in 2015, which was on the Paray-le-Monial – Lamure – Lozanne – Lyon railway route, fully opened in 1900 to take pressure off of the Paris – Lyon via Dijon line, but never electrified. Nowadays the TER 20 timetable contains 16 daily timings in each direction, but only 5 are trains: the other 11 are road-based TER services, and this goes a long way to explaining how so small a village has been able to benefit from the continuing presence of a bus and coach business. 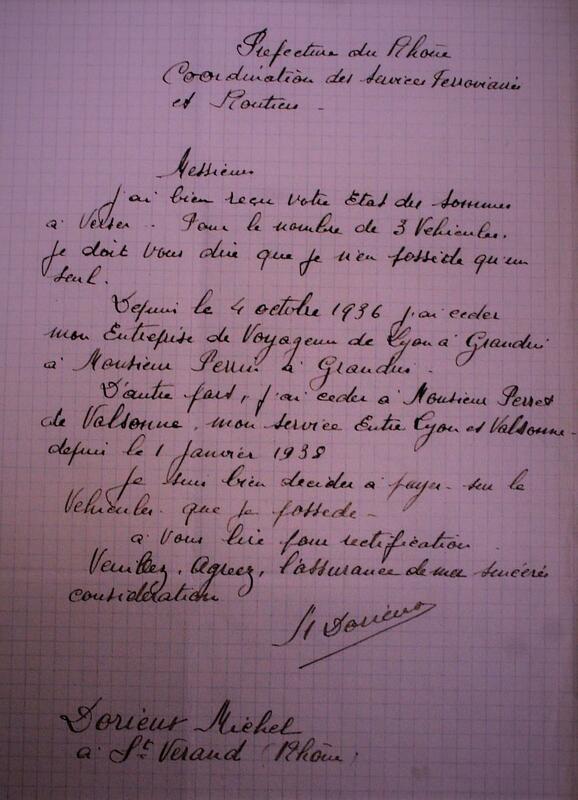 11/12/32 – this was the date when Michel Dorieux declared the existence of his Grandris – Lyon service. The mayor of Lyon had authorized buses to stop (permit n°186) at 7 stops in Lyon including Bellecour, Jean Macé and Cours de Verdun, and to lay over for 15 minutes maximum at Quai Jaÿr. The service operated daily with one morning and one evening return and a journey time of 1 hour and 40 minutes. 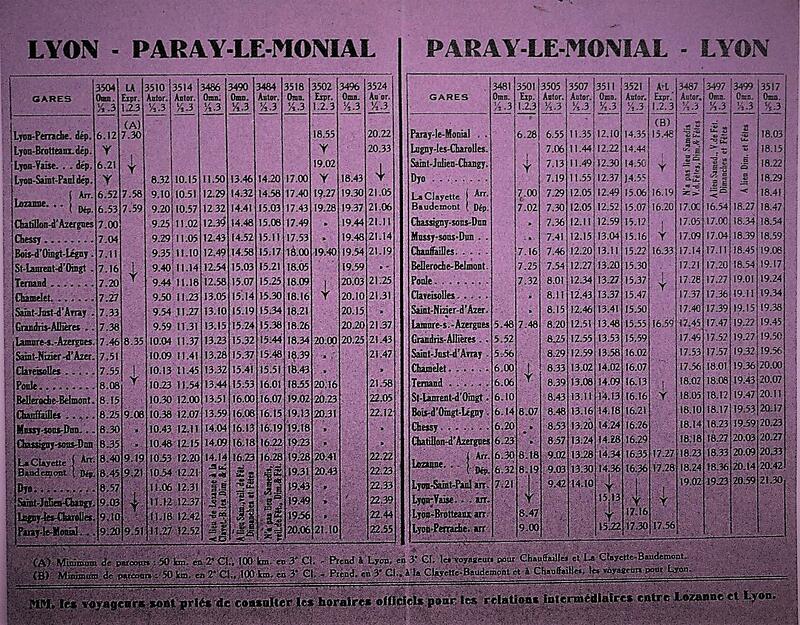 The authorities noted that the only competition on the route came from the PLM rail service from Givors to Paray-le-Monial. Mr Dorieux used a Renault SX Série 4 24 seater registered 8041 PF 3 and put into service on 04/05/32 – 2m20 wide weighing 3,200 kg empty and 5,000 kg with the maximum authorized load. But in fact, two vehicles must have been used, as a second permit (n° 9) from the mayor of Lyon gave identical authorisations for a Renault 3YAB 15hp 8600 PF 4 seating 23. 04/10/36 - Michel Dorieux (who we now learn was a cafe proprietor at St. Verand) sold Lyon – Grandris to a Monsieur Jean Perrin of RN 13, Villefranche sur Saône. No vehicles changed hands, and the sale price was 5,000 FRF. Mr Perrin then used a 22-seater on the route. 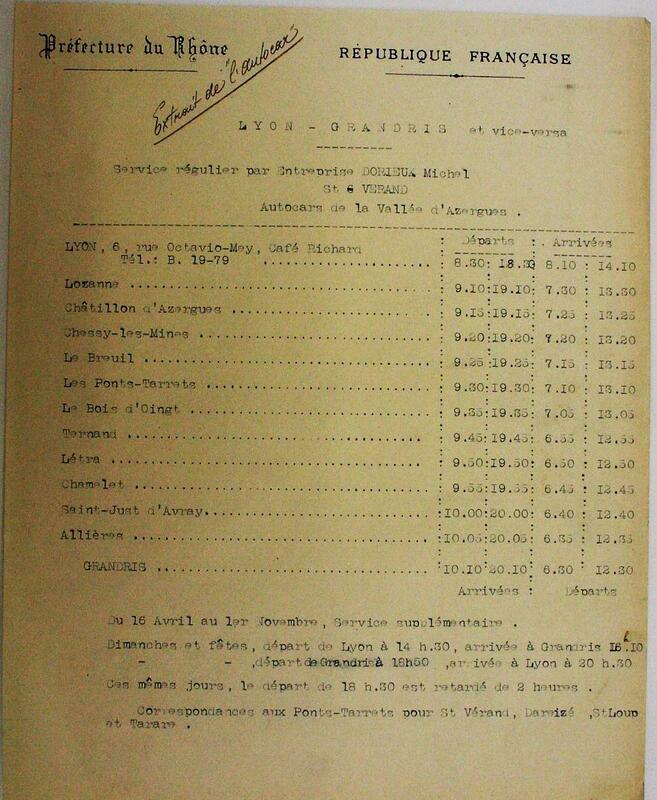 Incidentally, and a little later on 01/01/38, Mr Dorieux sold his Lyon- Valsonne service to a Mr Perret of Valsonne . Dorieux may also have been involved in a business known as the Messageries de Tarare . 10/04/47. As usual, operators were pressing for a return to pre-war frequencies. Perrin asked for 2 extra returns on Wednesdays, and one Tuesday mornings for the Bois d’Oingt market. In July 1947 the authorities said yes – to a service frequency of one return Monday to Saturday plus a second on Tuesdays – not really what he had asked for! June 1948 – a request for an extra Saturday return was granted. The CTD said that the PLAN DEPARTEMENTAL could allow 14 returns per week – Perrin was operating 7 plus this one makes 8 so that is all right. As I regularly say, refusals in these immediate post-war years are a reflection of rules designed to economise fuel, still a scarce commodity. 20/01/49 – more applications – for the summer – were authorized on 12/04/49. An extra Thursday service, and one at his customers’ request on Sundays, took his timings up to 10 (he was at 15 prewar). He was also authorized to divert the 12.15 service (on Tue Thu Sat Sun) via Lamure SNCF, providing a connection with the train. 28/04/50 – the need for a second Sunday return journey was so pressing that the Conseil Général 69 was lobbying for it to be put in place, and pointing out that prewar, there were 3 returns on Sundays. The stumbling block was the SNCF, who were vetoing because the coach undercut the rail fare – 3.45 FRF per km on the bus, 4.00 FRF on the train! This dispute went up to the Ministry of Transport in Paris, and produced a slanted response from the SNCF that they were not against the timing as such but wanted a level fares structure. Mr Jean PERRIN born at Bagnols (69) on 06/02/1897 took the first step towards selling his business, by leasing it to Mr Paul Marius DESMURE, born at St. Just d’Avray on 20/02/1921. As well as the route, included were premises at route de Thizy, Grandris, consisting of a garage/depot at ground floor level and an 8 roomed apartment above. The lease ran for 4 years from 01/01/56, and included a promesse de vente (sale clause) that could be exercised at any time up until 31/12/58. If the sale took place, the price would be 4 million FRF. The route frequency was currently 1 return on Mon/ Wed/ Thu/ Fri, 2 returns on Tue/ Sat/ Sun, and one summer extra on Thursdays. The sale did take place, though on 29/06/59. A route from Lyon to Grandris via Civrieux, with 2 returns daily, no pickups between Lyon and Civrieux. Current authorisations - 13 returns in winter, 14 returns in summer. Paul Desmure would in fact operate this route for 24 years (1959 to 1983). A Rochet-Schneider, 661 V 69, was used on the service in July 1956. The difficulty of relations with the SNCF came to the fore with the construction of a new college at Bois d’Oingt (see also below under schools services). 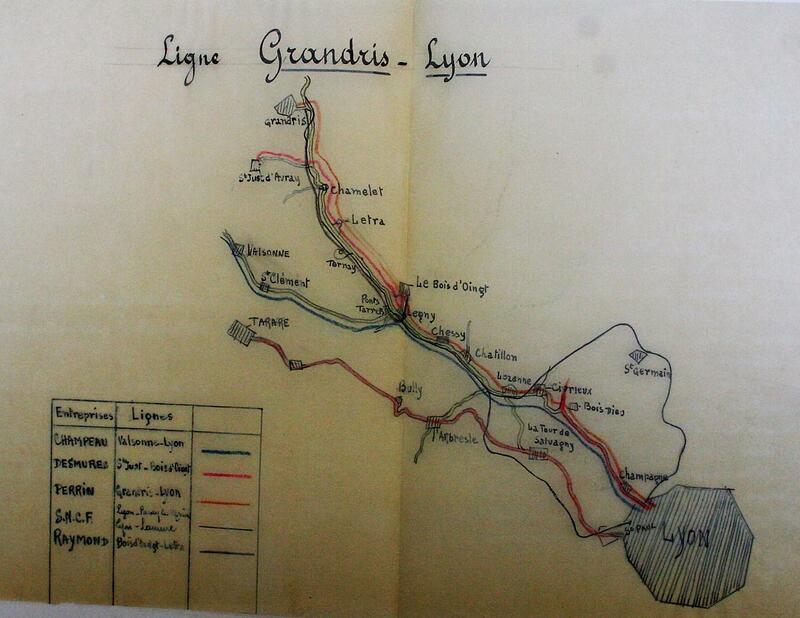 A ‘convention’ (protocol) was intended to ensure no unnecessary competition on the Lyon – Grandris/Lamure corridor. The authorization originally was for 14 returns per week (2 each day), but in fact 13 were operated – 3 on Sundays, 1 on Wednesdays and Fridays, 2 on other days. On 24/09/59 the CTD authorized an extra return on Saturdays, and on 01/04/65, for the summer timetable, an extra journey on Wed/Thurs/Fri – a total of 17 weekly returns. Now in 1969 Desmure wanted to retain these services in winter (except one Thursday journey), and to ADD THREE RETURNS limited to Bois d’Oingt on schooldays restricted to pupils and staff (three teachers travelled in from Lyon and the station was too far away from the college). The CTD was in favour. Another problem with the SNCF was the pricing of tickets. The bus fare must not undercut the rail fare. 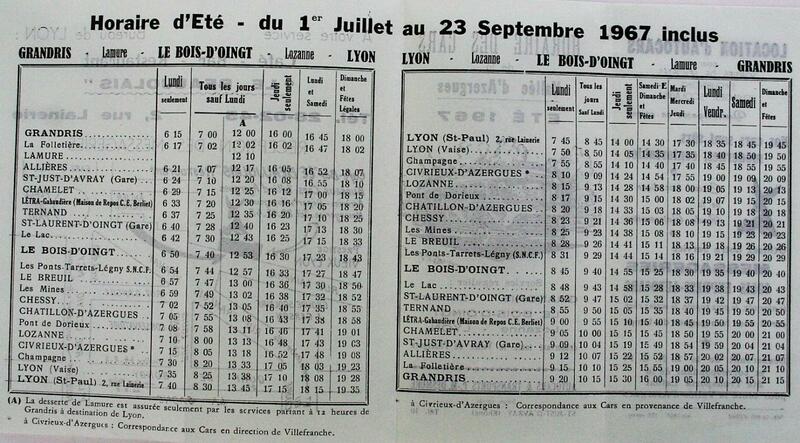 So on 15/04/85, The SNCF was advising that it was raising the price of its Lyon – Grandris ticket by 7.4% from 27 to 29 francs, and the buses should do likewise. Fine, but the DDE was reminding the company that the current bus fare (23 francs) was a maximum that already included the 3.5% 1985 increase authorized for interurban bus routes. How had this been dealt with in the past? Every increase required a special dispensation signed by the Préfêt. On this occasion, it was said that in view of the current tripartite discussions between the DDE, SNCF, and Vallée d’Azergues, the outcome should be awaited before approaching the Préfêt. 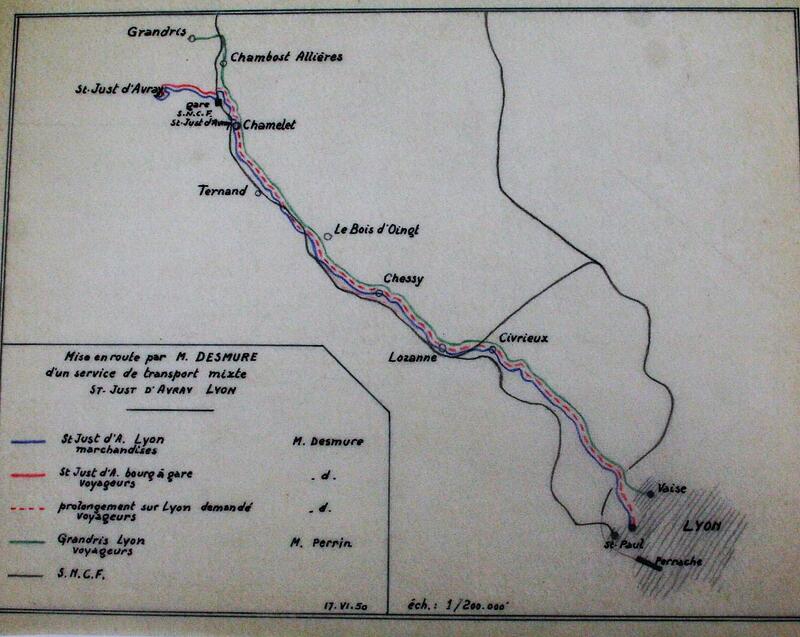 What happened is not recorded , but the Lyon – Grandris route is now long gone. 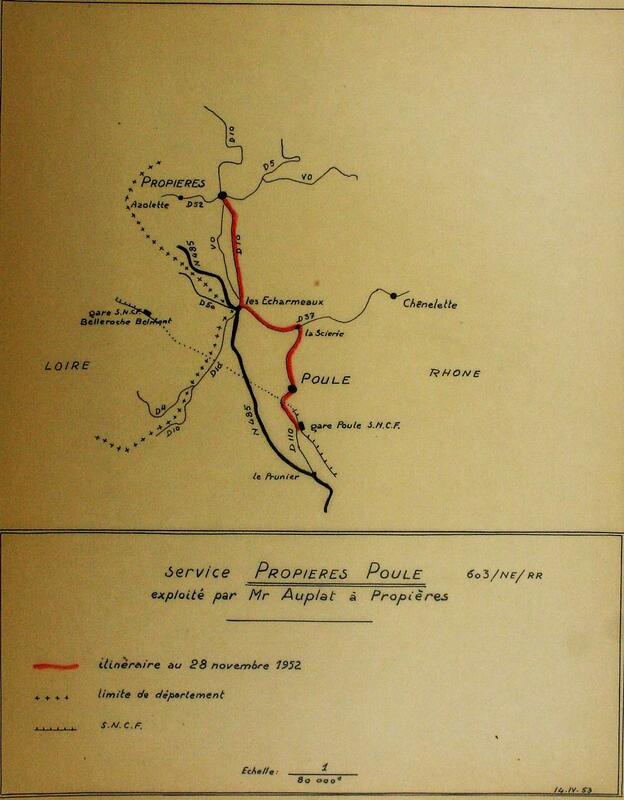 In 1935, Antoine AUPLAT was using a 12-seater vehicle to run a service from Propières to Poule. This route may have existed since 1904, but the evidence is tenuous. He was a correspondent for the PLM (there was a railway station at Poule) and he also received a subsidy from the PTT for carrying post. After the war, his 1946 authorised timetable was just one return daily. In 1947 he was authorized to run a market service from Propières to Chauffailles via Azolette on every Friday and on the 1st Thursday of the month. This required an extra 42 litres of fuel. Journeys had to be synchronized with the RSAR, who ran over the same route, to avoid unnecessary competition. Propières 07.30 – 08.10 Chauffailles 11.40 -12.20. 01/06/67 saw the end of postal services on Poule Propières . Another operator running a longer route covered the same villages, so it made sense for the PTT to avoid duplication. A reply from Paul Auplat (the son) said he would be losing income of 1.639,45 FRF for parcels and 3.415,95 FRF for post.. He would have to cancel the evening service, but would maintain the morning journey daily, and continue to meet all trains on Saturdays. But on 31/12/68 he sold to Desmure. Paul Antoine Auplat, born Propières 10/02/11, had inherited the business from his father Antoine (donation partage) on 09/10/40. Excursions - pickup limited to Rhône, all destinations in France authorized. Propières is 20 kms north of Grandis, so presumably the business was considered a good fit, geographically. Mr Pivot does not seem to have been on the best of terms with the authorities. But he must have expanded his activity without authority to do so. An amateurish outline of the Pivot routes – presumed to be at the moment of sale. In July 1940 – the Ponts et Chaussées put their foot down. The main vehicle used was 1660 PF 8, a Citroën CG G1 12hp. In reserve was 8404 PF, a Ford 22 seater. Claude Pivot sold out to Paul Desmure on 24/12/45 with effect from 01/01/46. Included in the sale were the routes – Amplepuis, Villefranche, Tarare, Thizy, le Bois d’Oingt plus a St Just local service operated jointly with Monsieur Large, and one vehicle – a Citroën 13hp chassis 722189 registered 3268 PG 2 and seating 23 + 7. NOT included in the sale was the business telephone number!! The price was 150,000 FRF (including 50,000 FRF for goodwill). On 23/01/46 Paul DESMURE (as successor to PIVOT!) was advising the Ponts & Chaussées, Service Carburants, that he had to stop almost all services for lack of allocated fuel. The previous Pivot allocations were insufficient for all routes (Claude Pivot had simply stopped running when he had no more fuel). For 300 km per week, with vehicles guzzling 35 litres per 100 kms, 500 litres of fuel per month were necessary. 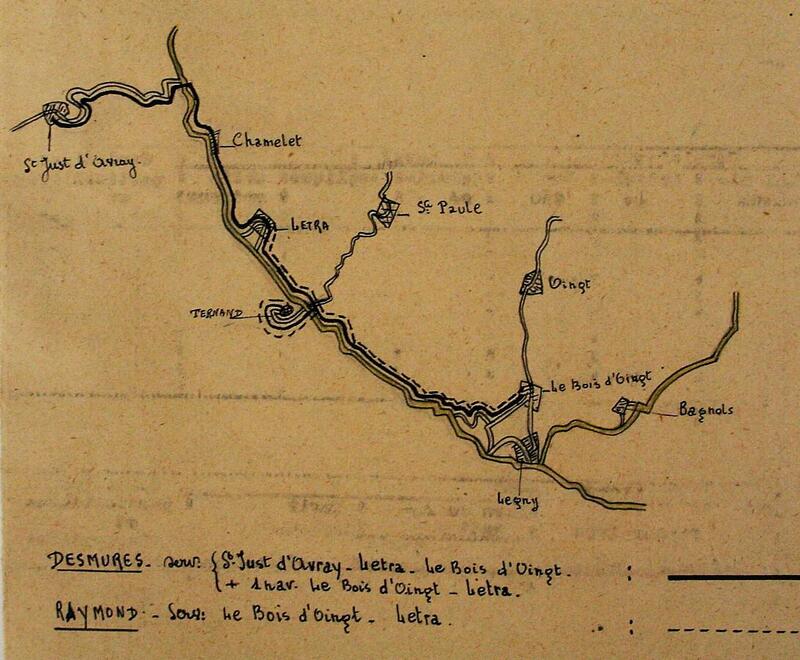 Still in 1946, the St Just d’Avray – Bois d’Oingt service was a source of problems. Before the war, it had been operated by a Mr Raymond, who ceased in 1940 because his two vehicles had been commandeered by the Army. Pivot and Large took over, and when Mr Raymond wanted to restart in 1946, Pivot was in possession and had already sold to Desmure. Who owned the rights? 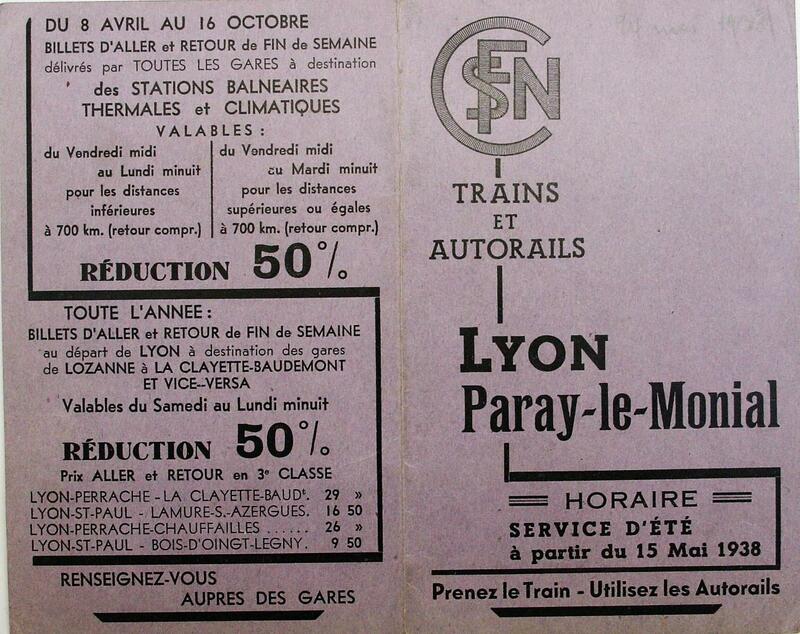 It took until October 1948 for the authorities to decide to order Desmure to stop running the Tuesday shuttle from Letra to Bois d’Oingt, which was allocated to Raymond. Desmure was authorized to operate the rest of the service, but at the service level of Pivot in 1939 – one return on Tuesdays. At this point the Letra municipality protested strongly, with a petition, claiming Desmure offered a better service and that Raymond’s vehicle was too small, and would need to make 2 or 3 trips, increasing fuel requirements. The Ponts et Chaussées stood firm, and the matter was only resolved on 05/12/1950 when Raymond sold out to Desmure for 25,000 FRF. Takings on the Letra route were declared to have been 90,000 FRF in 1948 and 94,520 FRF in 1949. Mr Raymond’s view of his route, in the days before typewriters! But in 1961 Desmure ceased operating this service on 2nd January, for lack of patronage. 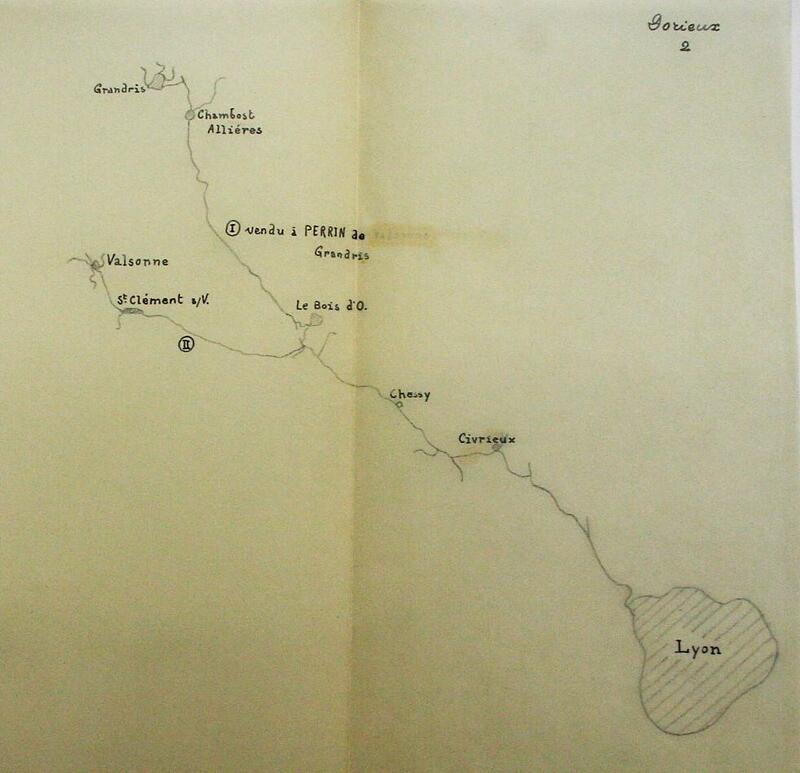 The authorities were able to accept because some timings on Grandris – Lyon provided an acceptable alternative. 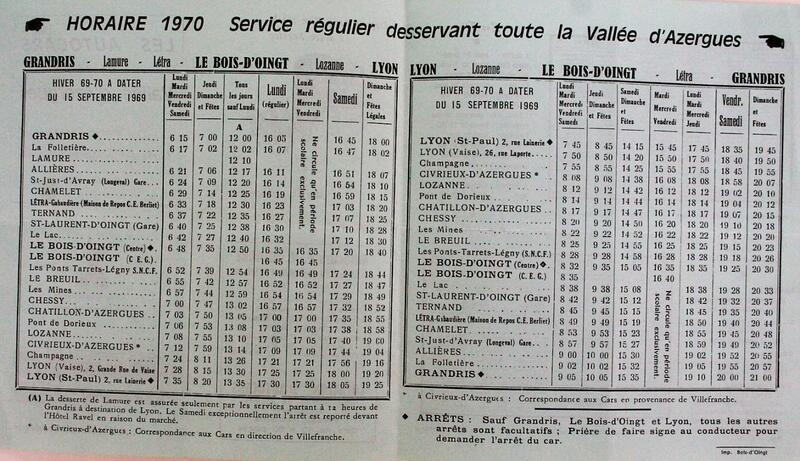 A little earlier, on 08/09/1960, the CTD had given its agreement to the end of the St. Just d’Avray – Amplepuis market service (once a month) where average loadings were 5/7 passengers. As for the Tarare service originating with Claude Pivot, it operated on Thursdays, the outward journey at 07.00 arriving 08.00, with the return journey at 12.15. By 1960, for lack of passengers, it was reduced to just 1st and 3rd Thursdays. With an average of 5/6 passengers (fare income 12/15 NF) on a 42 km round trip, unsurprisingly frequency was reduced to just the first Thursday in the month in 1961. In June 1963 it was classified as a ‘ligne à faible trafic’ with fare income of 0.35 NF per km…….. and it probably stopped running shortly afterwards. The remarkable saga of the Renault one and a half tonner. As you have read above, Paul Desmure had acquired a local passenger service in St. Just d’Avray connecting the Gare and the Bourg. 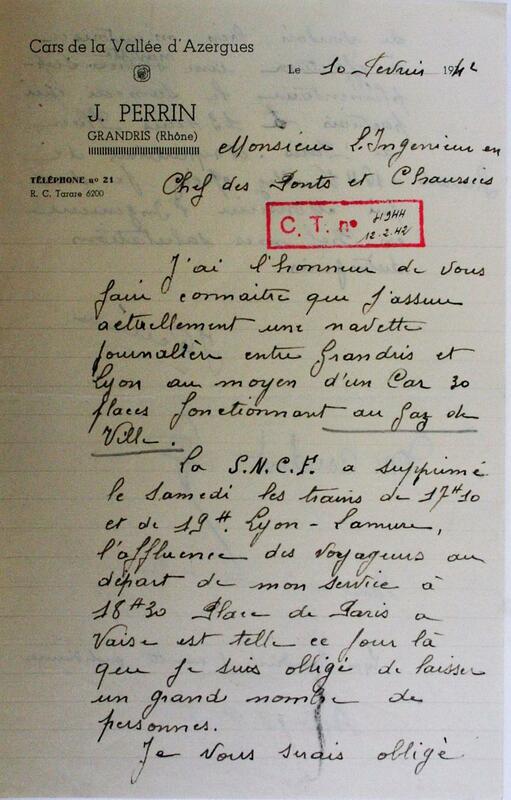 But he also had the authorization to carry “messageries” (packets & parcels) between St. Just d’Avray and Lyon. In 1949 on 5th December, he wanted to use a Renault 1,400 kg camionnette modified to take removable banquettes, to use indifferently for the two purposes, thus saving a vehicle. His request for an authorization was urgent, as he had already ordered the vehicle and made a down payment of 100,000 FRF. The CTD Comité Technique Départemental reluctantly agreed to this on 13th December. It was normally not allowed, as a result of the “affaire Perrier”, Givors, 21/10/1949 (I have no idea what happened in Givors). It was considered that the structure was not robust enough to carry passengers safely. The CTD agreed to a maximum load of 13 passengers, but not to mixed freight and passengers. The Renault had to be in one mode or the other. On 02/06/1950 Desmures was caught out in Lyon and given a warning – the vehicle, registered 9883 PG 6, was stopped while carrying freight AND 3 passengers. Fares income was 4,125 FRF for May 1950 and 1,160 FRF for the first 8 days of June, a total of 5,285 FRF for 936 kms operated. Between 28/08/50 and 07/09/50, 22 navettes of 12 kms were operated between the Gare and the Village, with 179 passengers paying a total of 4,275 FRF – roughly 16 FRF per km. 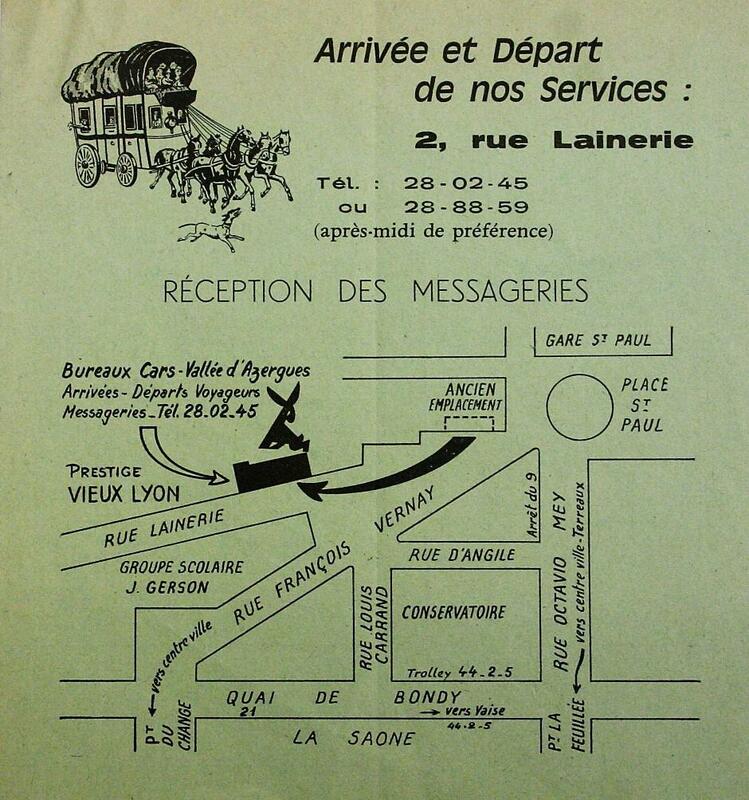 Messageries were insignifant – 10/12 parcels per month. Desmure was putting on the pressure, suggesting that without the extension to Lyon, the service might be cancelled for lack of profitability. The route the Renault would take…….. The CTD gave in on 26 October 1950, but it had to ensure this did not create a precedent. So this was recorded as “un service d’obligeance et d’entraide”, or as we might say these days, a socially necessary service. Of course, on 01/01/1956 Paul Desmure began operating Grandris –Lyon, so presumably the problem disappeared. 4. Services originating with Joseph Large. Joseph Robert Large was apparently a wine merchant (! 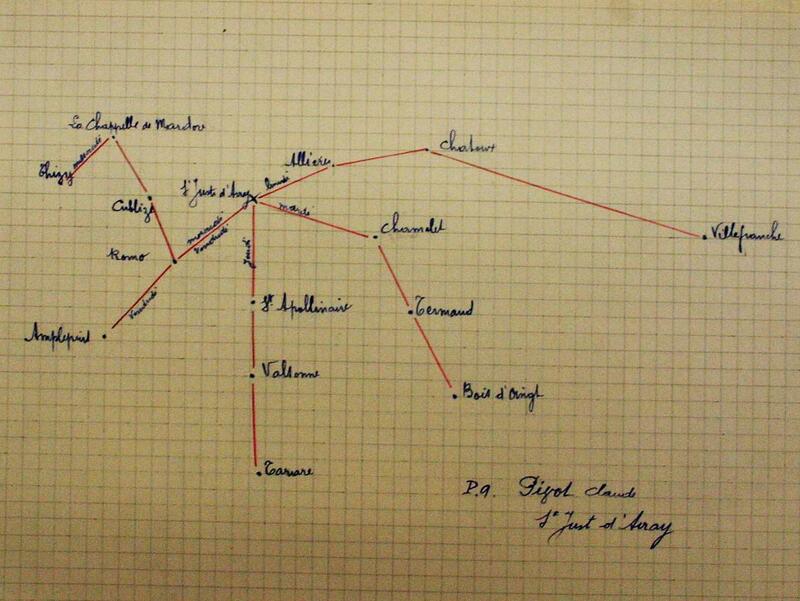 ), but in 1933 he started a route from St. Just d’Avray to Tarare. In 1940, and during the war years, there was a single Thursday return on that service, but two other services had been started – one to Amplepuis with a single Tuesday return, the other a town service for St. Jean d’Avray linking the Bourg and the Gare twice daily. The price was 150,000 FRF of which 70,000 represented goodwill. from the war years and post-war ceased building chassis. The lorry in this photo is the kind of chassis that would have been used. But this did not last long. Thirty months later on 24/01/49 Vignon sold exactly the same routes and timings to Paul Desmure for 250,000 FRF (of which 125,000 was goodwill). There must have been galloping inflation at the time. The vehicle had changed. Now it was a Citroën P32 registered 5468 PG 5. 5. Services originating with Bernard DESCROUX. Mr Descroux, born on 05/04/1943, was domiciled at Le Vieux Bourg, 69790 St. Clément-de-Vers. On 23/12/1981, he sold to Paul Desmure his service from St. Igny-de-Vers to Chauffailles via Anglure sous Dun. This operated on Fridays (market day) and occasionally on the first Thursday of the month. More interesting perhaps was an excursions licence (B695001) that he had held since 31/01/1975. One of his routes (St. Clément-de-Vers to Monsols) was not included in this sale but was adjudicated to Mr Desmure on tender as of 04/01/1982 – he was cheaper than rival company RSAR. - And 4,500 FRF for a Saviem SC5P, chassis n°507228, registration 1469 FW 69, a 37 seater new on 23/09/68. Bernard Descroux had bought or inherited the business on 28/12/1971 – the same routes and the Berliet vehicle – from Pierre Descroux (born 30/12/1911), although the precise relationship (father and son?) is not specified. 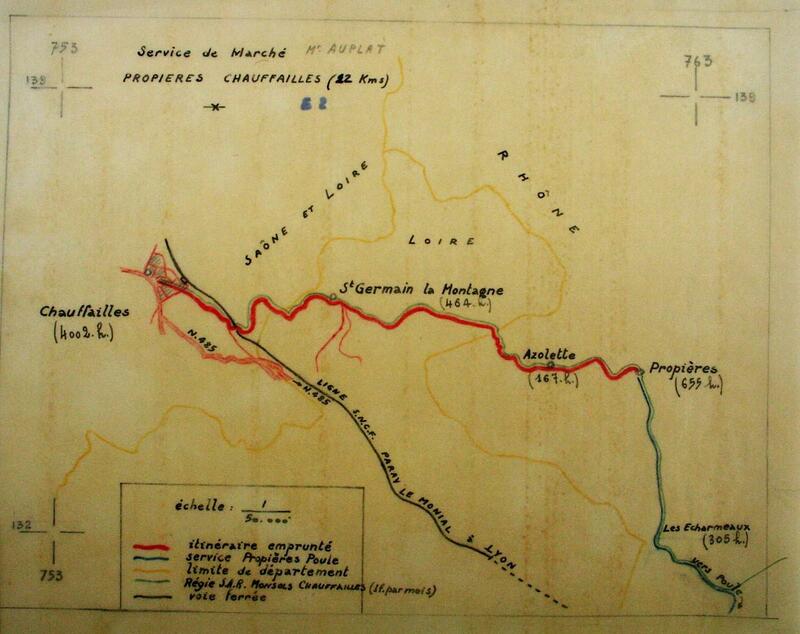 And Pierre Descroux had bought the route from RSAR on 28/07/1958 for 5,500 old francs. 6. Services originating with Pierre DUPONT. When he declared his services in 1934, he dated the oldest routes as beginning in 1928. - A Tuesday market service from Bois d’Oingt to Ste Paule (fare 4 FRF, return 7FRF subsidized by Ste Paule). As at 20/03/1936 his vehicles were a Citroën 10, chassis n° 260883 10hp registered 330 PF 5 and new on 31/08/33, and a Citroën CG G1 chassis n°163835 12hp registered 412 PF 2 new on 26/06/30. 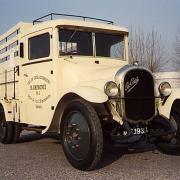 But the Citroën 10 was replaced by a Berliet 12hp diesel in July 1936. By 1952, the Ste Paule service was only running once a week on Tuesdays, and it was Autocars Paget of Lyon who were operating it. On 19/02/52 Paget said that Ste Paule would only be served on the 1st Tuesday of each month. It is stated that the service belongs to Desmure but is operated by Paget following a tri-partite agreement between Paget, Desmure and the Ponts & Chaussées. 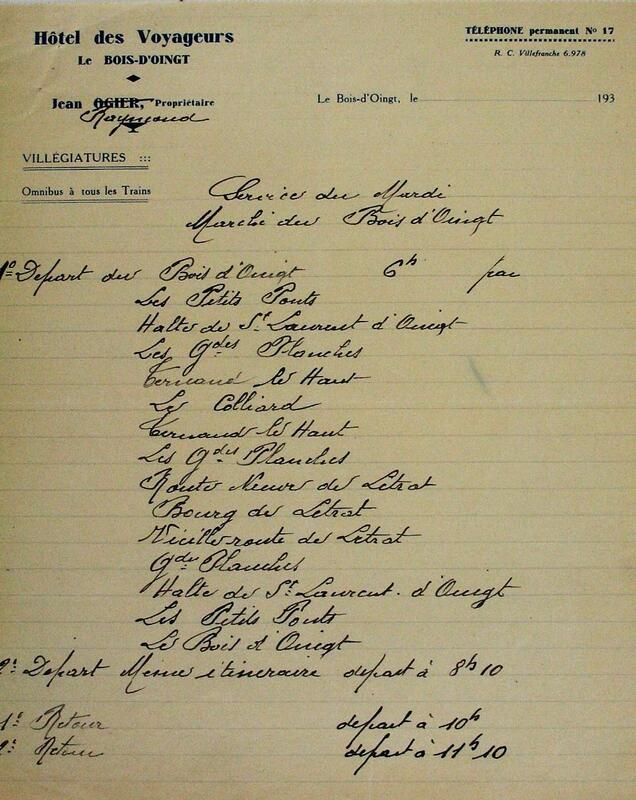 Jean Bornarel of Bois d’Oingt sold all to Desmure except the Bois d’OIngt – Gare – Legny service which he continued to operate with a limousine, on 09/11/1948. 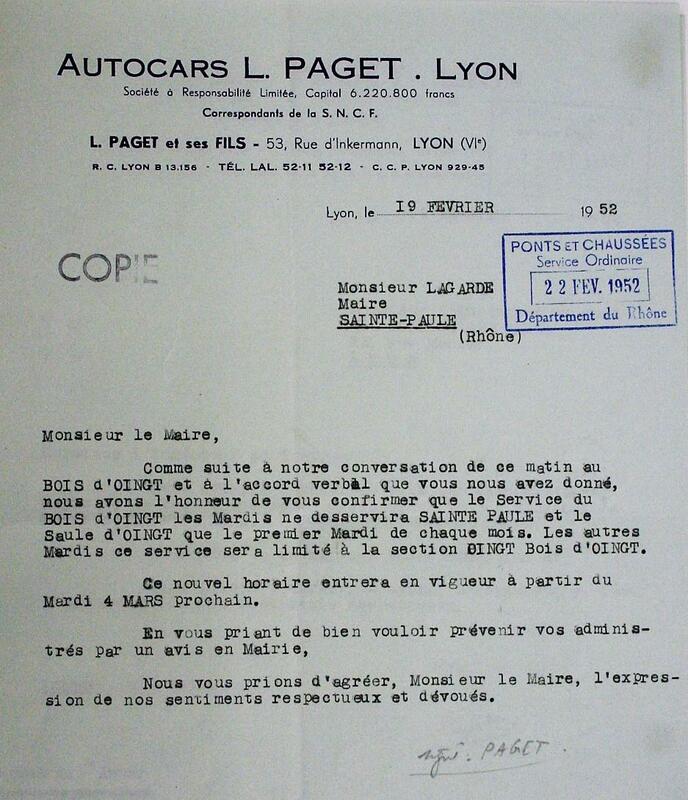 In 1949 Mr Desmure proposed an exchange of services with the RSAR Régie Services Automobiles du Rhône. He would give them the Bois d’Oingt service bought from Mr Bornarel in exchange for RSAR’s service from Théizé to Paray-le-Monial. Whatever the intentions, the project was abandoned. François OVIZE was another hotel owner, running the Hôtel des Voyageurs at Lamure-sur-Azergues. He ran one round trip on Mondays to the market in Villefranche, which he had started in December 1930, but he also had rights to excursions, taxis, ambulances in Lamure and the surrounding area. No vehicles were included, and the sale was signed on 22/03/1950 at a price of 2,000 FRF. 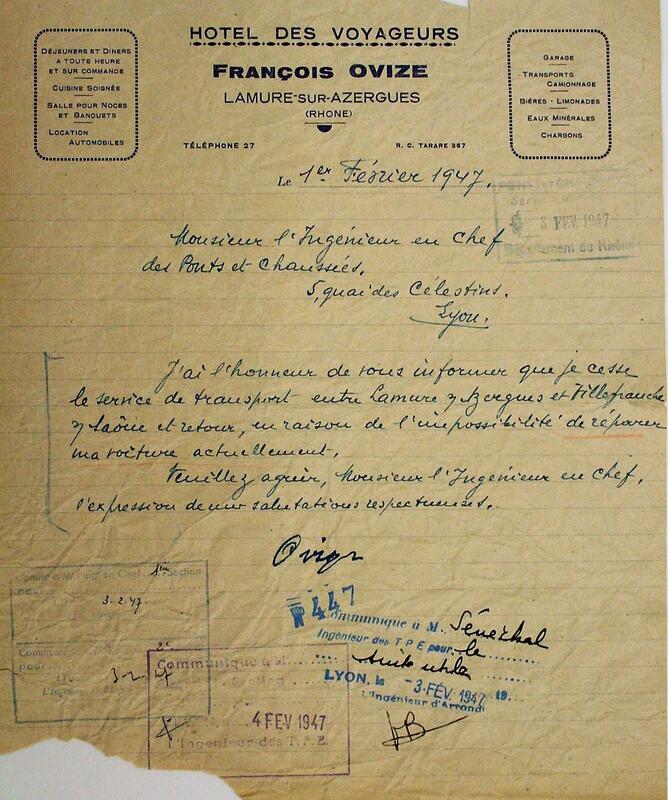 Ovize had used 5234 PF 2, a Peugeot 12 seater – type 1593 11hp 4m50 long by 1m25 wide. In a letter dated 01/02/47 (see below) Mr Ovize advised he was selling the service because of the impossibility of repairing his vehicle!! 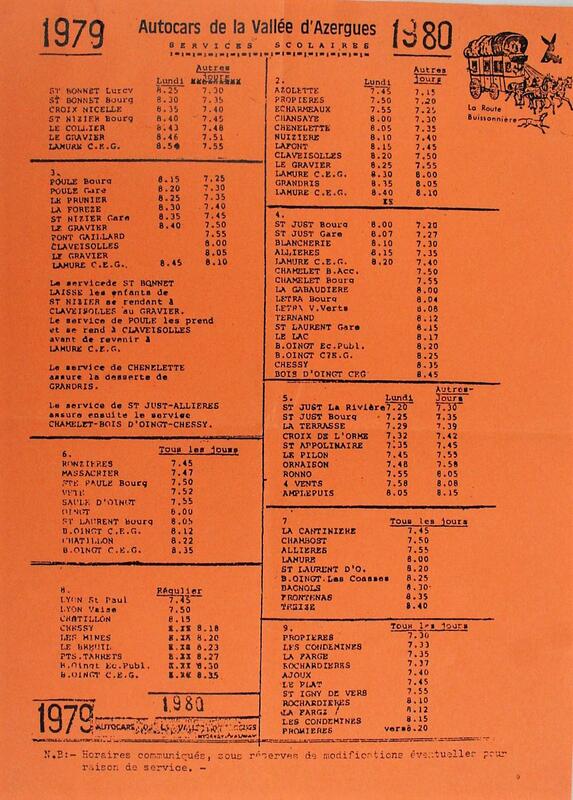 In the 1965 Guide Relations Routières Chaix, the company was listed with just the one route, Grandris to Lyon. Schools services – vehicles restricted to carrying schoolchildren, did not develop very early in France. 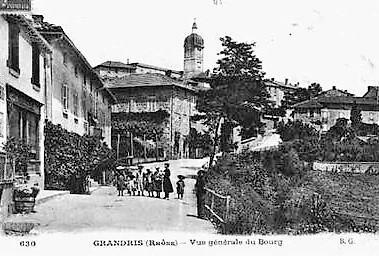 The first mention in this file – a decade earlier in July 1959 – was the desire of the Association des Familles de Grandris to have a service to the schools in Lamure. The problem then was that this could only be considered as a ‘closed’ private service if it served just a single school, not multiple schools. 07.30 St. Just d’Avray – 08.00 Grandris – 08.15 Lamure with a provisional authorization, given because shortly afterwards, new national legislation was to be introduced. But the big event was in 1969, with the opening of a new CEG – Collège d’Enseignement Général – at Bois d’Oingt. A meeting on 4th February 1969 to discuss arrangements for the first school year 1969 – 1970 was told that 122 children from 17 surrounding communes would need transport. Desmure’s first project was a 34 km circuit (plus 22 km return to depot) making 112 kms per day. 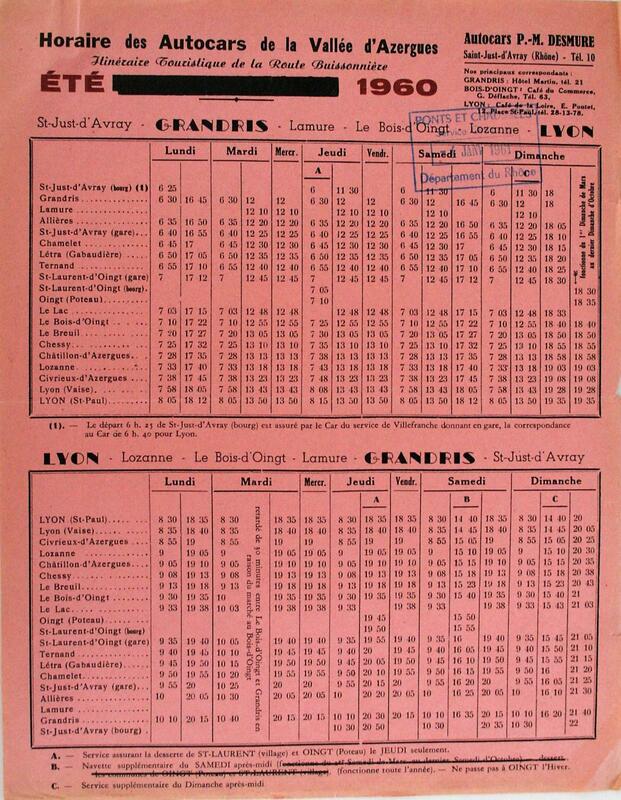 But the CTD preferred adjustments to timings on the Grandris Lyon route, in spite of complaints from the SNCF, and it would appear this won the day (see under Lyon – Grandris in 1969, when three returns limited to Bois d’Oingt and restricted to pupils and staff were authorised ). Paul Desmure requested a taxi licence (grande remise) apparently with the idea of operating a minibus on a Lamure local service and to the remoter parts of the valley. The DDE asked for further details, but the project seems to have been abandoned. Paul Desmure had remained a bachelor all his life, so when he died at Bron near Lyon on 18/09/83, it was his sister who inherited. Maybe his death was sudden, as no plan for what would happen to the business appears to have existed. Neither had all the diplomas necessary for the job, but in this state of emergency, they were authorized to operate on a one-year provisional basis by the Ponts & Chaussées whilst completing their studies, and this was successfully achieved. A peculiarity of the business subsequently was that the two new owners rotated the Managing Directorship, taking it in turns annually. 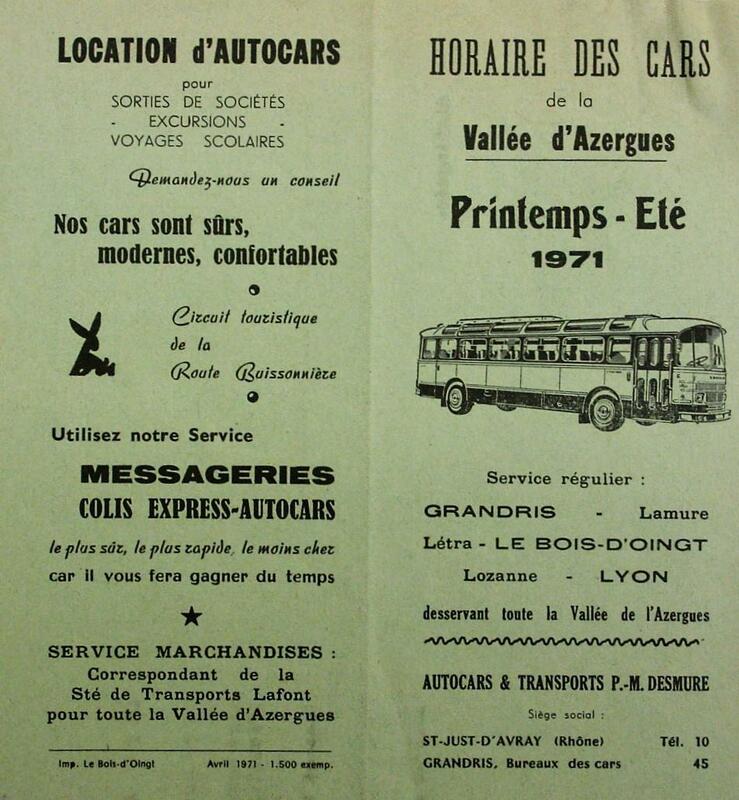 Les Autocars de la Vallée d’Azergues, ancienne entreprise P.M. Desmure, route de Grandris, 69 St. Just d’Avray, with a capital of 400,000 FRF, RCS Tarare B 329 022 768, President Emile Martin, Managing Director Hubert Millet, Directors Raymonde Martin (born 01/07/1932) and Charles Briday Millet (born 04/07/1940). Desmure’s business (RCS Tarare A727 370 652) described as a sole trader – Desmure trading as Les Cars de la Vallée d’Azergues et de la Route Buissonnière (! ), was taken off the companies register on 31/03/1984. It was a ‘location gérance’ contract, signed by Antonin Dressy, born on 30/05/1908 at Dieme (Rhône), and his wife Marie Rosine Desmure, born on 20/02/1909 at St Just d’Avray, both domiciled at St. Jean d’Ardières. The Grandris – Lyon route of course, but this was the only regular service, proof that all the country and market routes had been abandoned. No mention is made of schools. B694101, B694102, B695101, B695102, B695103, all acquired on 18/11/1974. These allowed pick-ups in Rhône, Ain, Isère, Loire and Saône-et-Loire, groups or individuals, all destinations in metropolitan France. E695106 and E695107 acquired 20/12/82, valid 5 years and not sellable or transferable. A travel agency licence – B 63058. The sale price was 500,000 FRF of which goodwill accounted for 300,000 FRF. Mr Desmure frequently changed the style of his logo. Here is an effort to follow the various changes. It is understood Paul Desmure set up in business as Cars de la Montagne in 1946. The title was certainly being used in 1950. His logo in 1969. It is understood “Cars de la Vallée d’Azergues” was first used in 1956 when he bought Cars Perrin.